Anne Bancroft was a highly regarded American actress whose career spanned 50 years. She was extremely versatile as would be expected as she had the Sun and Moon in two mutable signs, Virgo and Sagittarius. She played many major film roles but the role that brought her global attention was as Mrs Robinson in The Graduate where she played a married woman who seduces a young college graduate played by Dustin Hoffman. The film was released on December 21st 1967, on the very day that Pluto had come to a standstill in conjunction to Bancroft’s Sun. Pluto stayed in conjunction to her Sun until June 1970, marking a period when she received an Oscar nomination for the role but also worldwide recognition as an actress. Pluto’s aspects to the Sun always mark watershed periods in a person’s life, and this one was undoubtedly Bancroft’s graduation day. The only other Pluto / Sun transit in her lifetime was the square aspect in 2005. Anne Bancroft died of uterine cancer in June 2005 at the age of 73. Her death surprised many, even some of her friends. 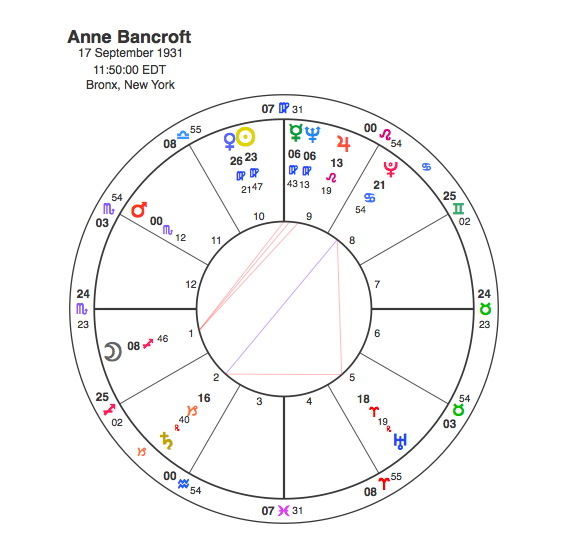 She was an intensely private person for an actor with a large profile, backed up by her Sun in Virgo and Ascendant in Scorpio, and had not released details of her illness. Pluto’s transits usually have a sudden unexpected quality to them and for her the two transits marked the symbolic peak of her life and the end of it. The other major turning point in Anne Bancroft’s life was meeting film director Mel Brooks in 1961, they married in 1964 and were together for 40 years until her death. Bancroft also won her only Oscar for a performance in The Miracle Worker in 1962. Pluto was square to her Moon from November 1960 to June 1963. The distant planet played a major role both in her film career and in her life.